Shaved Philly steak is back on the menu at Checkers and Rally's restaurants for a limited time and featured in the new Melty Steakzilla as well as the new Peppercorn Steak Burger. The Melty Steakzilla includes two beef patties, shaved Philly steak, crispy onions, Swiss cheese, and creamy peppercorn-seasoned cheese sauce on a toasted Kaiser bun. The Peppercorn Steak Burger (pictured) is basically a smaller version of the same sandwich and consists a single beef patty, shaved steak, Swiss cheese, creamy peppercorn sauce, and crispy onions served on a toasted Kaiser bun. 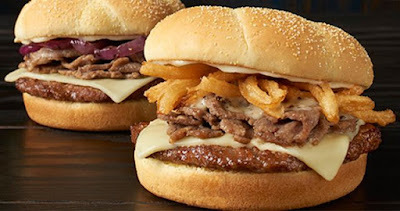 The chain has also brought back Philly Cheesesteak Burger, which features a grilled beef patty, shaved steak, Swiss cheese, grilled onions, and mayo on a toasted Kaiser bun. The smaller two burgers are value priced at $1.99 (may vary). Also new for the warmer months is a Watermelon Kool-Aid Slushie. Melty Steakzilla nutritional info not listed on the Checkers or Rally's website.